Each story has a beginning. This one started with an e-mail. "My name is Jean-Michel Maumont, financial partner of Marco Henry and Hugues Borsarello in Audiosophie sarl. 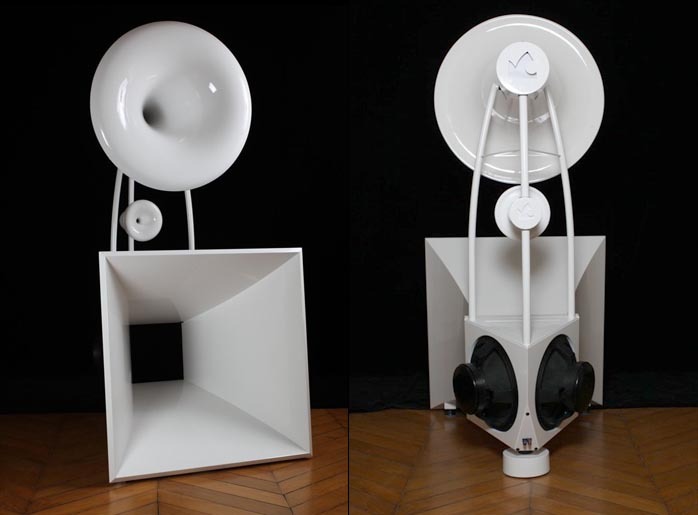 Marco and Hugues are the creators of the fully horn-loaded 3-way Grande Castine speakers you announced in the news section of 6moons last Friday on the recommendation of our friend Franck Tchang. We would like to invite you to Paris and hear our speaker." This had the makings for one of our quite popular RoadTours. I had indeed posted a brief news announcement after Franck Tchang of Acoustic System Int. had pointed me at the French website Musique Concrete and intimated that a closer encounter would be imminent. The last such invite had whisked me off to the South of France and Ocellia and PHY HP. How often does the opportunity arise to audition an ambitious new full-range hornspeaker not under the usually quite compromised show conditions? In principle and based on actual listening, I tend to prefer high-sensitivity speakers. Achieving 100dB+ values without horns is simply nearly impossible. Horns have their very own challenges, not the least of which is size when hornloading extends into the bass. Then there are specific colorations to overcome. Horns and bliss thus aren't instant bed fellows. Yet anyone with prior exposure to more or less successful horn installations will agree that the promise of bliss remains compelling. Thus today's format. Instead of beginning at the end with the fully finalized product, it starts closer at the true beginning. This sheds some light on the lengthy development process typical for such designs. They aren't conveniently modeled in software like conventional box speakers. They require much prototyping, resourcefulness, time and money. A certain craziness if you will. The name Grande Castine reflects on the speaker's development in Brittan'y Saint Cast Le Guildo near the famous Le Mont St. Michel. St. Cast's female inhabitants were known as Castines, hence Grande Castine. For specifics on the earlier iteration of the above photos, the active bass crossover had been 18dB @ 250Hz and the passive networks for the upper drivers were 6dB @ 300Hz and 6dB @ 4000Hz. The horn flare geometries meanwhile were based on Jean Michel Le Cleach formulae. 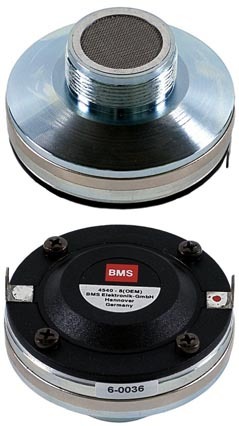 The German tweeter had been a BMS 4540ND, a 500g 1-inch throat neodymium-powered polyester diaphragm compression driver with 114dB sensitivity, response to 30kHz, 8- or 16-ohm impedance and a 1.5" voice coil on a Kapton former inside a 2.2 Tesla magnetic flux field. 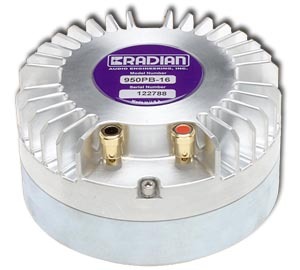 The accompanying 4.73kg Radian 950PB had been a 2-inch exit neodymium-powered aluminum diaphragm compression driver with Mylar suspension. Its usable response is from 500Hz to 20kHz, sensitivity 111dB, impedance 8 or 16 ohms. The 4" voice coil operates inside a 19,000 gauss flux field. The woofers were from Altec's 16-inch 515G Series which incorporates their largest 3.74kg Ferrite magnet structure, an edge-wound aluminum flat wire voice coil, a light cone assembly, low-distortion cloth suspension and a die-cast aluminum frame. The 30lbs 515-16G has an 11.3-ohm voice coil, a free air resonance at 37Hz, a BL factor of 25.1, a magnetic flux density of 15,000 gauss and—depending on chosen horn—a sensitivity from 103dB to 108dB. Jean-Michel Maumont's next e-mail arrived a day after the 2009 Paris show which had featured the Grande Castine on static display. Relative to comments I'd gotten from Franck Tchang after he had actually heard the speakers at their common dealer show room Connemara—he called the sound far from satisfactory—Jean-Michel explained. "Franck came for a very quick visit during the installation. This auditorium is quite small and the speakers were far too close to the side and front walls. We are currently working on an L-pad for the crossover as well as a special back chamber for the woofers to make for easier integration with smaller rooms. The earlier info on our drivers is no longer correct. We extensively tested every single transducer on the market and no longer use the BMS, Radian and Altec drivers. We switched to modified European pro drivers. The new woofer was from-the-ground developed just for us. It sports a lighter cone, stronger magnet and more sophisticated technology. "The bass horn now only covers the 80-300Hz range. The first two octaves are handled by a separate powered planar subwoofer. Franck came at the beginning of the installation when we'd been out of the auditorium. Connemara owner Edgar Morineau was not yet fully aware of the adjustments of the electronic filter on this sub-bass channel. We also had poor integration between lower and upper horn caused by the proximity of side and front walls with our open-rear bass horn. That never was the case in larger rooms. Now we are working on experiments to partially or totally enclose the 2 x 15" woofers without losing the openness of the sound—one of the strengths of this design—and facilitate integration with smaller rooms. Several very qualified persons have already visited us at Connemara. 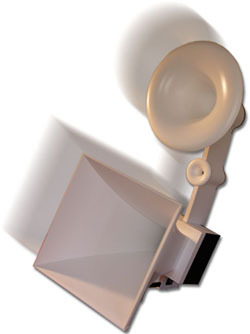 They very much appreciated the sound despite the room's limitation for this kind of speaker - Dominique Mafrand aka Pierre Andre Viollet, former reviewer of Prestige Audio Video magazine—"really amazing, sincerely"—and Jean-Marie Piel, Chief Editor of Diapason magazine - "the only horn speaker I know I could live with." "Our preference to not communicate the make of our new pro drivers stems from the fact that the moment one reveals their identity, people immediately conclude that they can predict the sound from previous encounters with those drivers in very different speakers. For the 2-incher, we modify the volume of its stock front compression chamber to adjust its low-pass function while our rear-chamber modifications create a natural high-pass filter. With the 1-inch tweeter unit, the phase plug connects directly to the horn flare and we decompress the rear chamber. We also bypass the stock connectors." At this juncture, silence set it and a few months passed. The men were busy with their redesign. Then Jean-Michel reappeared. "Yes it's been a long time since I was in touch. It took a lot more time and effort than forecast to rework our design and overcome the interaction problems we experienced in some rooms with the previous bass horn solution. I did not want to be back at you without completely satisfactory results and a conservative production schedule. 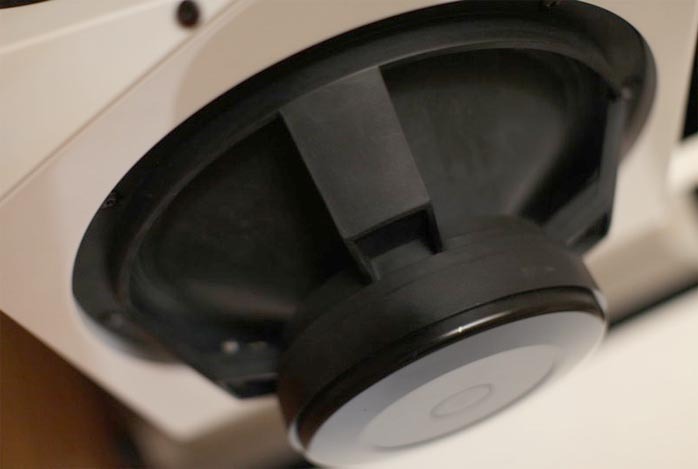 "After many trials, we found that the best way to limit these room interactions was to have a slightly deeper bass horn with a single driver instead of the two earlier sidefiring woofers. Now there are far fewer unwanted bass reflections from the side and front walls. We also took advantage of the remodeling process to redesign the speaker's support structure. We no longer use welded steel tubes but have gone to hot-molded wood. This has better vibration control, permits a 20% reduction in production costs and we think it also looks better. 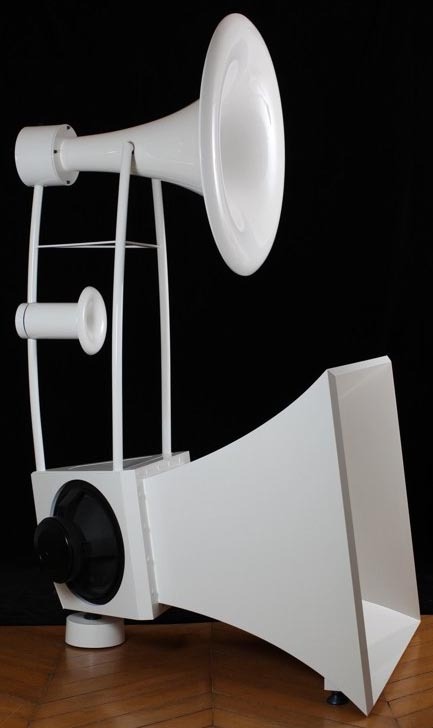 "Our first batch of Grande Castine hornspeakers is close to ready. The new molded wood structure has entered the 4-week multiple-layer lacquering process. We are very happy you accepted to visit and hear this ambitious speaker. The most convenient location really is my large house in Cognac near Bordeaux, an old Cognac winery. It's a perfect location to comfortably hear our system powered by our own prototype tube amp and preamp or Pass electronics. We will have prototypes of our 85 tube preamp and both AD1 and EL156 power amps as well as a Supratek Cabernet Dual preamp, a Mercury deHavilland preamp with their 845 monoblocks and First Watt's J2 and F3. We also have our quite revolutionary compact infra woofers to work below 80Hz." Deal.